Peace, we assume, is better than war. A society without slavery is better than one with. A science that shows the earth revolving around the sun is better than one that shows the sun revolving around the earth. But in what sense are they ‘better’? Religion has inspired many meaningful and saintly lives, but how can we account for this when it seems so often to be based on dogma? Middle Way Philosophy tries to answer questions like these, and it does so for a practical purpose. In order to make practical progress in our lives, we need some clarity about the theory that supports that progress: for every practical judgement we make depends on assumed beliefs of some kind. Religions and moral systems contain ideas of practical value that need to be separated from accompanying dogmas, without assuming that we can manage with no beliefs at all. Middle Way Philosophy thus brings together practically useful ideas from a range of sources, and tries to judge which are useful and which are dogmatic: a task which is always provisional and subject to further revision. This little book is a response to requests for a more manageable and practically-focused account of the ideas that I have been developing since 1997, and which have now come to be called Middle Way Philosophy. In 2013, for the first time, I held a retreat for a small number of people in which I tried to explain the core of the philosophy systematically in a series of talks, within the wider balancing context of relaxation, meditation, conversation, and artistic activity. I am grateful to the participants of this retreat both for the overwhelmingly positive response they gave me, and for their clear feedback that they wanted more brief, practically-focused accounts of Middle Way Philosophy, as free of technicality as possible. This book is one attempt to respond to this feedback. 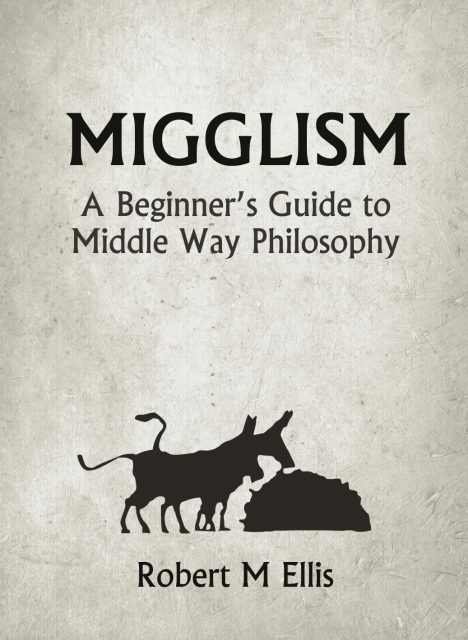 The title, ‘Migglism’, is an adaptation of a suggestion I owe to Peter Goble, who was looking for a shorter version of the rather lengthy term ‘Middle Way Philosophy’. Peter is, indeed, regularly using the verb “to miggle” meaning “to practise Middle Way Philosophy”, and others are also beginning to take up the term. The attraction of ‘miggle’ is its suggestion of babyish mispronunciation of ‘middle’, and it is thus a way of conveying that Middle Way Philosophy doesn’t always have to take itself too seriously. With its practical side comes humour and an acceptance of the childish within us. Middle Way Philosophy began as an attempt to explain in what sense ethics could be ‘right’ or ‘objective’ without appeal to God or any other such absolute ideas beyond our experience. In trying to answer such a question, I made use of insights and practical experience I had gained from Buddhist practice, but rejected any appeal to traditional Buddhist authorities and was very selective in the adoption of Buddhist terminology. These ideas have gone through several phases of evolution. They started off as a Ph.D. thesis, then for several years I was trying to develop them within Buddhism. However, I eventually recognised that they needed to stand independently of the Buddhist tradition. Although I have previously been involved in both Western and Secular forms of Buddhism, I found too many contradictions between the Middle Way and the more traditional elements in Buddhism. I am thus no longer a Buddhist, and Middle Way Philosophy involves no allegiance to the Buddhist tradition, though it acknowledges the Buddhist inspiration of the concept of the Middle Way. Recently, I have been engaged in the substantial project of creating an updated, multi-volume account of the philosophy in depth: the Middle Way Philosophy series. This series is now not far off completion. It attempts to combine detail, comprehensiveness, a reasonable degree of accessibility, and at least a fair academic standard of referencing. It is to this series that I will constantly refer readers who want more detailed information, argument, or explanation. However, the challenge I have set myself in this book is rather different. Setting myself a limit of 30,000 words, I have aimed to identify the key features of Middle Way Philosophy, and why it is relevant and important. Within this length, I cannot aim to convince the unconvinced. If you are unconvinced, please read my more detailed work; or better still come along to one of the further retreats that will now be held by the Middle Way Society, in which Middle Way Philosophy will be given some of the space it really requires to be understood. Instead, I aim merely to engage the curious. Middle Way Philosophy depends on several interdependent elements, which put together provide a basis for challenging widespread unhelpful assumptions in our society: assumptions about ourselves, about ethics, about knowledge, about science, about meaning, about religion and much else. These interdependent elements are outlined in the first section of this book as “departure points”. You could also see these departure points as different inspirations that I have encountered in putting together Middle Way Philosophy, so to reflect this I will approach them with a few personal stories. Putting these “departure points” together allows us to derive some “core theories” – the second section. The third section, “practical application”, shows how this overall approach provides a new rationale for a range of activities that can help us improve our lives. As for a final account of why I believe Middle Way Philosophy to be so important, and how you can engage with it personally, I leave that to the conclusion. At the end of each chapter I have offered a summary, to promote clarity about the main points, and suggestions for further reading. In most cases some of this further reading is from my own work, to provide a progression of detail for those who wish to look further at any areas of argument in Middle Way Philosophy. However, I have also suggested wider reading from other sources, which may be required in some cases to understand the context of where I am coming from. Rather than using a formal reference system I have tried to give more of an explanation of further reading, with further details of each book available in the bibliography. As one of the complaints about Middle Way Philosophy is often the use of terms in unfamiliar ways, I have also included a glossary at the end of the book. I hope this provides an account of miggling that, though not comprehensive, is both accessible and scalable. In part of my earlier career I was a Religious Studies teacher in a college. I was young, newly-qualified, and influenced by Buddhism. I was working in a small department with one colleague, who was an evangelical Christian. This might potentially have been a recipe for conflict, but actually for the most part we got on well, because we were able to reach sufficient agreement on our educational goals. However, there was one aspect of my colleague’s approach that intrigued and puzzled me. This was the way he coped with the requirement for “objectivity” in Religious Studies as an academic discipline whilst maintaining a strong personal belief in a particular Christian approach. He did this through a rigorous cut-off between the two. He would never talk about his “personal beliefs” in class, and saw his task as teaching the students about “religions” rather than in any sense teaching them religion. At the same time, of course, he favoured factual topics (such as Biblical Studies) that were more familiar to him from his own background. There seemed to me something very odd and unsatisfactory about this approach. For one thing, it was self-deluded in the sense that his beliefs were always rather obvious from the chosen topics, the way they were framed and communicated, and the assumptions made. For another, it seemed to result in a nervous repression that obviously created tension in him, for he had to hold back his passion for much that inspired him. Gradually, I began to realise that my colleague, despite his absolute beliefs in God’s revelation through the Bible, was also effectively conforming to the expectations of relativism. In the public sphere, where these expectations ruled, no religious view could be accepted as better than another. There were just different facts about religion laid out for examination, and then (so the implicit model went) students would exercise a private personal choice in deciding which belief to select. This way of operating was largely not the fault of my colleague, but rather the product of a set of attitudes and assumptions in modern society, which he had adapted to as best he could. Faced with clashes between incompatible absolute beliefs, modern “secular” society has often dealt with them by privatising them and making public space theoretically neutral. This disjunction is perhaps most obvious in the US, where religion is privatised by the constitution; but even in the UK, the feeble relics of established Anglican consensus co-exist inconsistently in the public sphere with a large degree of practical secularisation. The neutrality sought in this secularising approach goes too far to another extreme in its avoidance of religious dogma, tending to create depersonalisation, inner conflict, and confusion about how we should make the judgements necessary in our lives. Based on my previous experience of Buddhism, I felt there had to be a better way. For myself, I felt that I could teach Religious Studies without the disjunctive stress that my colleague was suffering from, because I felt that religions primarily offered resources for a process of spiritual investigation and development. We do not need to relate to religions just as incompatible revelations – and indeed, the more we do so, the harder it becomes to engage in Religious Studies with one’s whole experience. Understood differently, the subject could unite the personal with the academic rather than dividing them. Rather sketchily at that point, I felt that the way forward might have something to do with the Middle Way of the Buddha. By the time I left that teaching job, I had determined to study for a Ph.D. in Philosophy, in which I worked out what kinds of solutions the Middle Way might offer to the disjunction between absolutism and relativism. My puzzlement about my colleague and the ethos he represented thus created the roots of Middle Way Philosophy. The Buddha is a historical figure, Siddhartha Gautama, who lived in Northern India about 2500 years ago. It is his life story before he was said to have achieved enlightenment (nirvana) that provides a symbolic account of the Middle Way in experience. Although we have this story from Buddhist scriptures of various kinds, the value of the story only needs to be understood symbolically and does not depend at all either on the historical truth of the stories about the Buddha, or on scholarly arguments about scriptures – so please lay these sorts of concerns aside. The Buddha-to-be is said to have been brought up as a prince in a palace, where he was indulged in every pleasure and protected from all sources of pain and suffering. However, he was troubled even as a young man with a sense of dissatisfaction with this life, and was also said to have had spontaneous meditative experiences. One day, on a chariot ride out of the palace, he encountered an old person, a sick person and a corpse, which all seem to have represented a sudden recognition of suffering that he must have been denying or repressing. He is also said to have encountered a mendicant holy man, which made him aware of the possibility of an alternative way of life. Fired by this experience, Siddhartha Gautama is said to have “gone forth”, renouncing his luxurious life in the palace, giving up all his belongings and social position, and becoming a wandering mendicant in the jungle. He is said to have been focused on finding a solution to the suffering he had suddenly become aware of, and wandered around seeking the instruction of different teachers to find the right way. After learning from two different teachers but then becoming dissatisfied with their limitations, he joined a group of five ascetics who were practising austerities: bringing suffering on themselves in the expectation that this would lead to rewards in a future life. Siddhartha tried this approach too, nearly killing himself through extreme fasting, but eventually recognised that it did not provide any solutions. At this point, Siddhartha hit upon the Middle Way. He recognised that neither indulging in pleasure nor practising austerities would help him – but what would help him was to maintain health and meet the basic conditions of life for his mind and body. He would also not find any solutions by going along with the conventions of his closeted royal family on the one hand, nor the absolute ideas about rewards in a future life that motivated the ascetics on the other. By this means, balancing his outlook and avoiding two different types of delusion, the Buddha is said to have attained enlightenment. It has always been the Buddha’s method here that has interested me much more than his supposed results. Given their commitment to this method, I am puzzled by the obsession that many Buddhists, including Western ones, seem to have with the Buddha’s enlightenment and the revelatory authority that they believe flows from that enlightenment. I do not know whether or not the Buddha achieved nirvana, still less what that means if he did. Assertions about it lead us into a scholarly quagmire of authority claims, which is not only likely to bog us down, but is also of no practical use to us. Of much greater interest is the method that the Buddha used to make progress, the Middle Way. This method is of universal significance because it can be used flexibly at all sorts of different levels in all sorts of different contexts. It can thus be applied and checked in experience rather than being dependent on authoritative claims made about a person in a remote time and place. Our understanding of the Middle Way can be reinforced by many other stories about the Buddha’s teachings. Perhaps the most important of these is that the Buddha, when asked questions about claims that lie beyond experience, such as whether the universe is infinite or eternal, or whether there is an eternal soul, remained silent. He neither affirmed nor denied such claims, but when pressed said that it was not useful to take a position on them. needs to be tuned neither too tight nor too slack, but just with the right degree of tension – a direct physical analogy for the Middle Way. So, the Buddha’s Middle Way is the first of the starting points for Middle Way Philosophy. This Middle Way is both an epistemological principle (a principal for justifying our beliefs) and a moral principle. According to the Middle Way, we make progress by avoiding different types of claims that lie beyond experience. Claims that lie beyond experience are known as metaphysical claims. Crucially, the Middle Way involves not just avoiding positive metaphysical claims (such as “The universe is infinite” or “God exists”) but also their negative counterparts (such as “The universe is finite” or “God does not exist”). Since these sets of opposed beliefs involve different types of delusion, to make any kind of progress we need to avoid getting trapped in them. The Middle Way offers an insight that can help us resolve the problem of absolutism and relativism. We do not just have a choice between the absolute – i.e. accepting a big claim about how things are on authority – and the relative – i.e. denying these big claims and falling back on the conventions of our society. The Middle Way provides a model for how we can stretch our relative perspective without trying to jump to an absolute one, provided we constantly resist the temptation to turn the Middle Way itself either into an absolute or a relative value. How this stretching works will gradually unfold. To follow the Middle Way, we need to rest content with the ambiguity that follows when we do not accept either absolute perspective. There are many introductions to the life of the Buddha available, and most of these make some reference to the Buddha’s early life and the Middle Way teachings. However, I have yet to come across a source that focuses only on the Middle Way in the Buddha’s life. A collection of early texts relating to the Buddha’s life has been made by Ñanamoli, The Life of the Buddha. Some key references for teachings relating to the Middle Way in the Pali Canon are as follows: Majjhima Nikaya 63 for the Buddha’s ‘silence’ on metaphysical issues and the parable of the arrow; Anguttara Nikaya 3.65 for the Kalama Sutta, which applies the Middle Way to judgements about belief; Majjhima Nikaya 22 for the parable of the raft; Anguttara Nikaya 6.55 for the lute strings analogy. For a more detailed account of how the Middle Way can be separated from Buddhism as a whole, see my book The Trouble with Buddhism. Terms that appear in the glossary at the end (of which dogma is the first) are italicised on their first appearance.